For the video game, see Exploration (video game). "Explorer" and "Explorers" redirect here. For other uses, see Explorer (disambiguation). "Expeditions" redirects here. For other uses, see Expeditions (disambiguation). In scientific research, exploration is one of three purposes of empirical research (the other two being description and explanation). The term is often used metaphorically. For example, an individual may speak of exploring the Internet, sexuality, etc. The Phoenicians (1550 BCE–300 BCE) traded throughout the Mediterranean Sea and Asia Minor though many of their routes are still unknown today. The presence of tin in some Phoenician artifacts suggests that they may have traveled to Britain. According to Virgil's Aeneid and other ancient sources, the legendary Queen Dido was a Phoenician from Tyre who sailed to North Africa and founded the city of Carthage. Hanno the Navigator (500 BC), a Carthaginean navigator explored the Western Coast of Africa. The Greek explorer from Marseille, Pytheas (380 – c. 310 BC) was the first to circumnavigate Great Britain, explore Germany, and reach Thule (most commonly thought to be the Shetland Islands or Iceland). through the western Sahara, toward the Niger river and actual Timbuktu. through the Nile river, toward actual Uganda. though the western coast of Africa, toward the Canary Islands and the Cape Verde islands. through the Red Sea, toward actual Somalia and perhaps Tanzania. All these expeditions were supported by legionaries and had mainly a commercial purpose. Only the one done by emperor Nero seemed to be a preparative for the conquest of Ethiopia or Nubia: in 62 AD two legionaries explored the sources of the Nile river. One of the main reasons of the explorations was to get gold using the camel to transport it. The explorations near the African western and eastern coasts were supported by Roman ships and deeply related to the naval commerce (mainly toward the Indian Ocean). Romans organized several explorations also in Northern Europe, and as far as Asia up to China . With the acquisition of Ptolemaic Egypt, The Romans begin trading with India. The Empire now has a direct connection to the Spice trade Egypt had established beginning in 118 BC. Romano-Chinese relations begin. Ptolemy writes of the Golden Chersonese (i.e. Malay Peninsula) and the trade port of Kattigara, now identified as Óc Eo in northern Vietnam, then part of Jiaozhou, a province of the Chinese Han Empire. The Chinese historical texts describe Roman embassies, from a land they called Daqin. Roman traders reach Siam, Cambodia, Sumatra, and Java. An embassy from Roman Emperor Antoninus Pius or his successor Marcus Aurelius reaches Chinese Emperor Huan of Han at Luoyang. During the 2nd century BC, the Han dynasty explored much of the Eastern Northern Hemisphere. Starting in 139 BC, the Han diplomat Zhang Qian traveled west in an unsuccessful attempt to secure an alliance with the Da Yuezhi against the Xiongnu (the Yuezhi had been evicted from Gansu by the Xiongnu in 177 BC); however, Zhang's travels discovered entire countries which the Chinese were unaware of, including the remnants of the conquests of Alexander the Great (r. 336–323 BC). When Zhang returned to China in 125 BC, he reported on his visits to Dayuan (Fergana), Kangju (Sogdiana), and Daxia (Bactria, formerly the Greco-Bactrian Kingdom which had just been subjugated by the Da Yuezhi). Zhang described Dayuan and Daxia as agricultural and urban countries like China, and although he did not venture there, described Shendu (the Indus River valley of Northwestern India) and Anxi (Arsacid territories) further west. 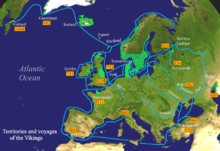 From about 800 AD to 1040 AD, the Vikings explored Europe and much of the Western Northern Hemisphere via rivers and oceans. For example, it is known that the Norwegian Viking explorer, Erik the Red (950–1003), sailed to and settled in Greenland after being expelled from Iceland, while his son, the Icelandic explorer Leif Ericson (980–1020), reached Newfoundland and the nearby North American coast, and is believed to be the first European to land in North America. Polynesians were a maritime people, who populated and explored the central and south Pacific for around 5,000 years, up to about 1280 when they discovered New Zealand. The key invention to their exploration was the outrigger canoe, which provided a swift and stable platform for carrying goods and people. Based on limited evidence, it is thought that the voyage to New Zealand was deliberate. It is unknown if one or more boats went to New Zealand, or the type of boat, or the names of those who migrated. 2011 studies at Wairau Bar in New Zealand show a high probability that one origin was Ruahine Island in the Society Islands. Polynesians may have used the prevailing north easterly trade winds to reach New Zealand in about three weeks. The Cook Islands are in direct line along the migration path and may have been an intermediate stopping point. There are cultural and language similarities between Cook Islanders and New Zealand Maori. Early Maori had different legends of their origins, but the stories were misunderstood and reinterpreted in confused written accounts by early European historians in New Zealand trying to present a coherent pattern of Maori settlement in New Zealand. Mathematical modelling based on DNA genome studies, using state-of-the-art techniques, have shown that a large number of Polynesian migrants (100–200), including women, arrived in New Zealand around the same time, in about 1280. Otago University studies have tried to link distinctive DNA teeth patterns, which show special dietary influence, with places in or nearby the Society Islands. The Chinese explorer, Wang Dayuan (fl. 1311–1350) made two major trips by ship to the Indian Ocean. During 1328–1333, he sailed along the South China Sea and visited many places in Southeast Asia and reached as far as South Asia, landing in Sri Lanka and India. Then in 1334–1339, he visited North Africa and East Africa. Later, the Chinese admiral Zheng He (1371–1433) made seven voyages to Arabia, East Africa, India, Indonesia and Thailand. The Age of Discovery, also known as the Age of Exploration, is one of the most important periods of geographical exploration in human history. It started in the early 15th century and lasted until the 17th century. In that period, Europeans discovered and/or explored vast areas of the Americas, Africa, Asia and Oceania. Portugal and Spain dominated the first stages of exploration, while other European nations followed, such as England, Netherlands, and France. Important explorations during this period went to a number of continents and regions around the globe. In Africa, important explorers of this period include Diogo Cão (c.1452 –c.1486) who discovered and ascended the Congo River and reached the coasts of the present-day Angola and Namibia; Bartolomeu Dias (c. 1450–1500), who was the first European to reach the Cape of Good Hope and other parts of the South African coast. Explorers of routes from Europe towards Asia, the Indian Ocean, and the Pacific Ocean, include Vasco da Gama (1460–1524), a navigator who made the first trip from Europe to India and back by the Cape of Good Hope, discovering the ocean route to the East; Pedro Alvares Cabral (c. 1467/68–c.1520) who, following the path of Gama, claimed Brazil and led the first expedition that linked Europe, Africa, America, and Asia; Diogo Dias, who discovered the eastern coast of Madagascar and rounded the corner of Africa; explorers such as Diogo Fernandes Pereira and Pedro Mascarenhas (1470–1555), among others, who discovered and mapped the Mascarene Islands and other archipelagos. António de Abreu (c.1480–c.1514) and Francisco Serrão (14?–1521) led the first direct European fleet into the Pacific Ocean (on its western edges), through the Sunda Islands, reaching the Moluccas. Andres de Urdaneta (1498–1568) discovered the maritime route from Asia to the Americas. In the Pacific Ocean, Jorge de Menezes (c. 1498–? ), discovered Papua New Guinea. García Jofre de Loaísa (1490–1526), discovered the Marshall Islands. Explorations of the Americas began with the initial discovery of America by Christopher Columbus (1451–1506), who led a Castilian (Spanish) expedition across the Atlantic, discovering America. After the discovery of America by Columbus, a number of important expeditions were sent out to explore the Western Hemisphere. This included Juan Ponce de León (1474–1521), who discovered and mapped the coast of Florida; Vasco Núñez de Balboa (c. 1475–1519), who was the first European to view the Pacific Ocean from American shores (after crossing the Isthmus of Panama) confirming that America was a separate continent from Asia; Aleixo Garcia (14?–1527), who explored the territories of present-day southern Brazil, Paraguay and Bolivia, crossing the Chaco and reaching the Andes (near Sucre). Álvar Núñez Cabeza de Vaca (1490–1558) discovered the Mississippi River and was the first European to sail the Gulf of Mexico and cross Texas. Jacques Cartier (1491–1557) drew the first maps of part of central and maritime Canada; Francisco Vázquez de Coronado (1510–1554) discovered the Grand Canyon and the Colorado River; Francisco de Orellana (1511–1546) was the first European to navigate the length of the Amazon River. The routes of Captain James Cook's voyages. 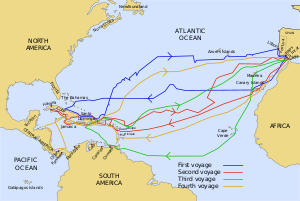 The first voyage is shown in red, second voyage in green, and third voyage in blue. Ferdinand Magellan (1480–1521), was the first navigator to cross the Pacific Ocean, discovering the Strait of Magellan, the Tuamotus and Mariana Islands, and achieving a nearly complete circumnavigation of the Earth, in multiple voyages, for the first time. Juan Sebastian Elcano (1476–1526), completed the first global circumnavigation. In the second half of the 16th century and the 17th century exploration of Asia and the Pacific Ocean continued with explorers such as Andrés de Urdaneta (1498–1568), who discovered the maritime route from Asia to the Americas; Pedro Fernandes de Queirós (1565–1614), who discovered the Pitcairn Islands and the Vanuatu archipelago; Álvaro de Mendaña (1542–1595), who discovered the Tuvalu archipelago, the Marquesas, the Solomon Islands and Wake Island. Explorers of Australia included Willem Janszoon (1570–1630), who made the first recorded European landing in Australia; Yñigo Ortiz de Retez, who discovered and reached eastern and northern New Guinea; Luis Váez de Torres (1565–1613), who discovered the Torres Strait between Australia and New Guinea; Abel Tasman (1603–1659), who explored North Australia, discovered Tasmania and New Zealand. In North America, major explorers included Henry Hudson (156?–1611), who explored the Hudson Bay in Canada; Samuel de Champlain (1574–1635), who explored St. Lawrence River and the Great Lakes (in Canada and northern United States); and René-Robert Cavelier, Sieur de La Salle (1643–1687), who explored the Great Lakes region of the United States and Canada, and the entire length of the Mississippi River. Long after the golden age of discovery, other explorers completed the world map, such as various Russians explorers, reaching the Siberian Pacific coast and the Bering Strait, at the extreme edge of Asia and Alaska (North America); Vitus Bering (1681–1741) who in the service of the Russian Navy, explored the Bering Strait, the Bering Sea, the North American coast of Alaska, and some other northern areas of the Pacific Ocean; and James Cook, who explored the east coast of Australia, the Hawaiian Islands, and circumnavigated the Antarctic continent. There were still significant explorations which occurred well into the modern age. This includes the Lewis and Clark expedition (1804-1806), an overland expedition dispatched by President Thomas Jefferson to explore the newly-acquired Louisiana Purchase and to find an interior aquatic route to the Pacific Ocean, along with other objectives to examine the flora and fauna of the continent. The United States Exploring Expedition (1838-1842) was an expedition sent by President Andrew Jackson, in order to survey the Pacific Ocean and surrounding lands. With the advent of satellite imagery and aviation, exploration of Earth has largely ceased, however the culture of many disconnected tribes still remain undocumented and left to be explored. Humanity is continuing to follow the impulse to explore, moving beyond Earth. Space exploration started in the 20th century with the invention of exo-atmospheric rockets. This has given humans the opportunity to travel to the moon, and to send robotic explorers to other planets and far beyond. Both of the Voyager probes have left the Solar System, bearing imprinted gold discs with multiple data types. A 2015 study, performed on mobile phone data and on GPS tracks of private vehicles in Italy, demonstrated that individuals naturally split into two well-defined categories according to their mobility habits, dubbed "returners" and "explorers". "Explorers" showed a star-like mobility pattern: they have a central core of locations (composed by home and work places) around which distant core of locations gravitates. ^ Roth, Jonathan 2002. The Roman Army in Tripolitana and Gold Trade with Sub-Saharan Africa. APA Annual Convention. New Orleans. ^ di Cosmo 2002, pp. 247–249; Yü 1986, p. 407; Torday 1997, p. 104; Morton & Lewis 2005, pp. 54–55. ^ Torday 1997, pp. 105–106. ^ Torday 1997, pp. 108–112. ^ Otago University. Wairau Bar Studies 2011.Dr L. Matisoo-Smith.2011. ^ a b Luca Pappalardo; et al. (8 September 2015). "Returners and Explorers dichotomy in Human Mobility". Nature Communications. 6: 8166. doi:10.1038/ncomms9166. PMC 4569739. PMID 26349016. ^ Luca Pappalardo. "Are you a returner or an explorer? Ask Big Data". www.bigdatatales.com. Petringa, Maria (2006). Brazzà, a Life for Africa. Bloomington, IN: AuthorHouse. ISBN 1-4259-1198-6. OCLC 74651678. Look up exploration in Wiktionary, the free dictionary.